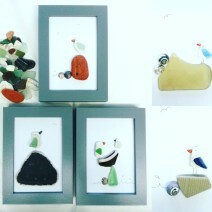 These little seagull pictures are handmade in the gallery studio and are all completely unique. The stock available will differ from the photo so please contact if you wish to see current stock before buying! Made from beach finds of all kinds including pebbles, sea glass, wood, shells and plastic sometimes too! Measures 6"x4" inside the frame.